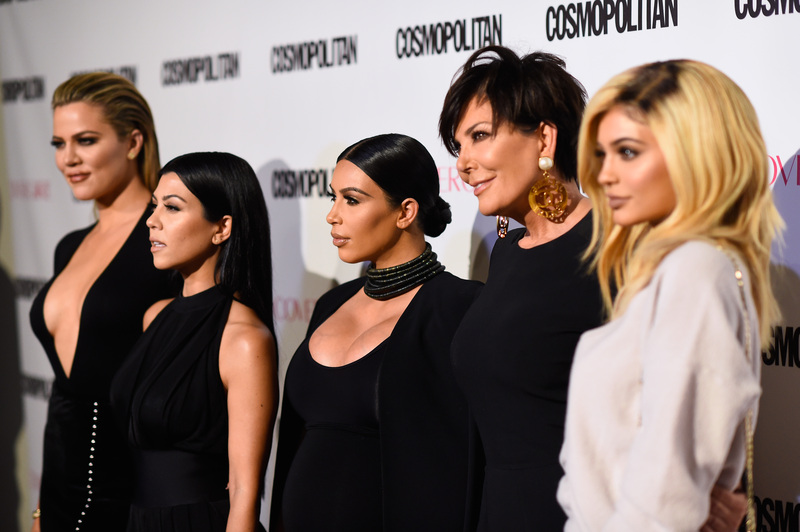 Leave it to the Kardashians to throw one of the most lavish birthday parties in recent history. According to Mirror, the Kardashian clan threw a $2 million Gatsby-themed birthday party for matriarch Kris Jenner, who turned 60 on Nov. 5. Everyone who attended Jenner's party truly committed to the 1920s theme, wearing an array of flapper gowns and fur stoles, while puffing on fake cigarettes and drinking champagne in true Gatsby fashion. Kylie Jenner stole the show (like always) in an uber glamorous floor length beaded gown, perfectly coifed finger waves and a dark red lip. She posed for photos with Tyga, who wore a white tux as they stood next to a Rolls-Royce. About halfway through the evening, Kylie made a wardrobe change, slipping into a silky white gown adorned with feathers. She also posed with big sis Kourtney Kardashian, who took a different approach to the '20s theme, wearing a tuxedo rather than a slinky dress. Kendall Jenner looked like a true flapper, wearing a short reddish blonde bobbed wig along with beaded headband, a silver flapper dress and a lavish fur wrap. Khloe rocked a vintage beaded headpiece and a long sleeve floor length silver beaded gown paired with a white fur stole. The pregnant Kim Kardashian kept her look the most tame, wearing a pretty beaded frock that accentuated her curves and kept her hair sleek and glam with a deep side part and large curls. Kris went all out to celebrate her 60th birthday, wearing a short black wig, a pretty headpiece, a floor length white gown and a lot of fur accessories. Other party attendees included Kanye West, Chrissy Teigen, who looked absolutely gorgeous in a navy blue flapper frock, her husband John Legend, Lisa Rinna, and the Kardashian's publicist pals Jonathan Cheban and Simon Huck. Everyone who attended Kris' party looked absolutely fabulous. I'm willing to bet they made Gatsby proud. I can only hope that one day I will be able to attend a party as glamorous as this one. One that allows me to make outfits changes a la Kylie Jenner.